The NBN Co has the mandate to provide high-speed broadband services for all Australians. Yet, when we walk the streets in the suburbs of our capital cities we see that in many cases there are already two existing ultra-broadband Hybrid Fibre Coaxial (HFC) networks in place. Networks that were destined, on a political whim, to be shut-down. The NBN Strategic Review has identified these underutilised assets and proposes to use them to deliver ultra-broadband services to more Australians, faster, and cheaper than any alternative solution. This step will allow the NBN Co to focus construction activities on areas where there are currently insufficient assets. For an alternate view, please refer to Simon Hackett’s HFC in the NBN. In May 2014 Bain & Co have released their view on HFC relative to FTTB and FTTN: “Is it too soon to declare cable the winner in the broadband wars?“. As noted in the NBN Strategic Review, the inherent advantages of HFC over alternatives have seen the technology gain ground in the deployment of super-fast broadband networks. The services offered by carriers using HFC are often double in speeds over alternative technologies. For example, in the United Kingdom the Virgin Media HFC network reliably provides services at 110Mb/s (even in peak hour), competing against BT’s FTTN solution (source OFCOM). In Spain, in October 2012, for the second consecutive year, ONO received the award for the fastest broadband operator in Spain. ONO is the leader of the high-speed broadband sector in Spain, thanks to its DOCSIS 3.0 technology, which provides high Internet access speeds using the hybrid HFC network. And, perhaps the most relevant and clear market statistic is in the United States, where over the past twelve months HFC (Cable Operators) have added 1.8 million new customers, in the face of direct competition with AT&T FTTN and Verizon FTTH networks. 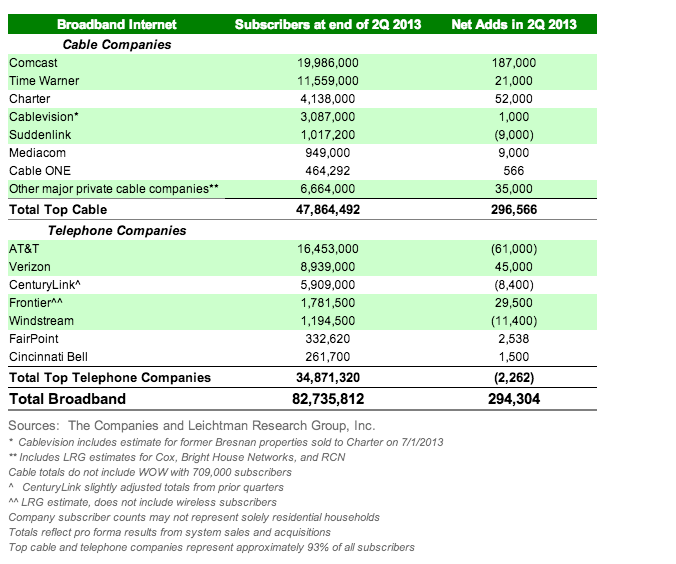 Seventeen of the largest cable and telecom companies in the U.S. added roughly 295,000 broadband subscribers in Q2 of 2013, according to Leichtman Research Group. These providers now serve 82.7 million subscribers, with cable companies providing broadband access to 47.8 million users and telephone companies working with nearly 34.9 million subscribers. This research from the US which suggests HFC cable operators are increasing their lead on Telcos in the broadband stakes, and that FTTH fibre connections are largely converting existing ADSL customers. The European and American Cable Operators have worked to ensure that their HFC infrastructure has a standardised long-term performance scaling roadmap. The current DOCSIS3.0 technology can provide peak speeds of 400Mb/s to consumers, on a suitably provisioned network. Capacity can be easily scaled by “splitting” service areas, or by adding capacity by deploying additional systems onto the current network infrastructure. The roadmap to DOCSIS3.1 standardises peak speeds of up to 10Gb/s to consumers. Whilst it may be some time before this speed is required, and the technology to support it is cost effective, the standardisation is already in place. Matt Schmitt, Director of CableLabs DOCSIS Specifications, has this to say. It is recognised that HFC networks are less reliable than fully fibre networks, even though by nature a significant component of a HFC network is optical fibre. The costs to maintain and operate a HFC network have been estimated at between $15 and $25 per home passed per year. In comparison a fully fibre network is around $4 per home passed per year. However, the difference in operational cost is never sufficient to recover the capital cost of providing a full fibre network. It always remains cheaper to operate an existing HFC network, than to replace it with a full fibre network. The current services provided over the Australian HFC networks are dimensioned to compete with ADSL based services, and are often significantly under-invested. There are no technical impediments to the NBN Co providing its own standardised service levels over the same HFC network infrastructure. As a specific example of this capability, of the 14 ISP packages included in the most recent OFCOM Broadband Speeds Report for the United Kingdom, Virgin Media’s (HFC) ‘up to’ 120Mbit/s service achieved the fastest download speeds, an average of 112.6Mbit/s. During the peak-period average download speed on Virgin Media’s ‘up to’ 120Mbit/s was faster than 104Mbit/s. Having achieved a performance of double BT, their nearest competitor, there is little incentive for Virgin Media to continue to increase the performance gap. In the United States the situation is a little different, as HFC is competing directly with FTTH GPON network services provided by Verizon. Here the FCC regularly measures broadband speeds. The most recent FCC report contains a wealth of information, but specifically both Cablevision (HFC) and Verizon (FTTH) are able to achieve greater than 100% of advertised speeds during the busy hour period, and both Cablevision and Verizon are the top performers and their service levels are nearly identical during the entire day. In Australia, the current operators of HFC networks don’t have much to compete against (only ADSL services) and further they were compelled by government policy through the NBN Co Definitive Agreements to shutter their HFC networks, and migrate their customers off. Hardly a scenario for further investment in capacity, and this created the basis for the current complaints about the “HFC networks” locally. There is an example of this situation in the United States, as evidenced by the same FCC Broadband America reports. In 2011 and 2012 the situation for Cablevision’s customers was roughly similar to the situation facing Optus’ customers. Cablevision was the worst of the worst in 2011 and 2012, but by appropriate upgrades to their infrastructure and implementation of “best practice” capacity management they are now amongst the best broadband providers in the United States. HFC technology is unique in that it enables the NBN Co to scale and manage its investment in network capacity in line with the take-up of and demand for its services. This flexibility and scalable performance characteristic is quite unlike some network technologies, which require all of the investment in customer access ports to be made in advance. Significant numbers of homes in MDUs are not currently addressed within the HFC areas. The NBN Strategic Review addresses the issue of serving Multi-Dwelling Units, and notes that agreements would need to be made with the Bodies Corporate and utilities suppliers, and that the NBN Co would need powers to compel access to MDUs in line with its service obligations. In the United States the FCC has created rules to regulate the in-building HFC wiring of MDUs to facilitate standardisation, and competition. There is no technical impediment to the NBN Co servicing MDU premises with HFC based services. Optus and Telstra do not service MCUs currently, because of the difficulty these two operators experienced in reaching agreements with the Bodies Corporate for provision of an optional cable-TV service. The situation for the NBN Co, as a utility provider, would be quite different. The NBN Co would have no impediment in providing broadband services to MDUs, as it would have similar arrangements to those enjoyed by the electricity, gas, and water utilities currently. In comparison with other network technology, HFC networks can be upgraded to provide NBN Services at a fraction of the cost. The NBN Co Strategic Review has determined that the existing HFC networks can be upgraded at around $100 per premises, based on overseas experience. The NBN Co HFC services can be provided faster to Australians than any other network technology. The technology to provide greater than 100Mb/s services already exists and has been proven around the world. The NBN Co will use this existing experience to deliver services to more Australians more quickly. In millions of cases, a HFC network is already connected to customers’ homes, allowing the NBN Co services to be provided without any physical changes for the home owner. As soon as the contractual negotiations and regulatory changes are completed, and the network upgrades are completed, the NBN Co will be able to begin offering services. Currently, the largest HFC network passes ~2.7 million premises (in metropolitan areas across Adelaide, Brisbane, Gold Coast, Melbourne, Perth and Sydney). Using the HFC networks enables the NBN Co to provide services across all of these homes in the shortest possible timeframe, and to allocate its resources into building new networks where there is no current viable network option. The Strategic Review describes a number of Scenarios for implementing the NBN. I think that the obvious Scenario was omitted. In my opinion, the right path for the NBN Co is to build a hybrid of Scenario 2 – a radically redesigned cost optimised FTTP solution, and Scenario 4 – using HFC in locations where it already exists. Also, given the high cost of FTTP for longer country lead-in and rate of advance of LTE technology, extending the fixed wireless LTE solution from 4% of the country to around 15% of the country (being to locations where FTTP is not economic) is a real alternative in terms of speed, capacity and time to deliver services to country Australians. Additionally, there has been little discussion of increasing the amount of fibre being buried to enable a true “home run” direct fibre solution in the future. I think that we should look closely at the cost/benefit for providing sufficient dark fibre for a 1-fibre-per-customer Layer-1 wholesale option. Direct fibre is the long-run solution for the whole country, so we should look at starting early if we can. This entry was tagged hfc, HFC networks, nbn, NBN Co. Bookmark the permalink.